Drafted fourth overall in the 2001 draft, Floyd was the Phillies hig hest ranked prospect, but never lived up to his expectations. In 2005, he had a 10.04 ERA and 1.77 WHIP and in 2006 a 7.29 ERA and 1.88 WHIP. In the 26 innings he pitched in 2005, he was 1-2, allowed 29 earned runs on 30 hits and 16 walks, including five home runs. Opponents batted .283 and had a .924 OPS against him. His strike out per walk ratio was 1.06. He spent the majority of the season as a starter, where he had a 6.75 ERA. In 4.2 innings out of the bullpen, he allowed 15 runs, 13 earned. At Citizen’s Bank Park, his ERA was close to 16. 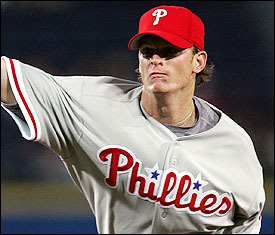 In his 3 year career with the Phillies, Floyd had a 6.96 ERA with the Phillies. He will forever be remembered as the pitcher who threw the pitch to Xavier Nady in which Aaron Rowand made a “great, great, perhaps game saving catch!” in 2006. Floyd was traded to the Chicago White Sox in 2006, and had a successful 2008 season. He set career highs in practically every pitching category. His ERA was 3.84 and struck out 145 batters in 206.1 innings.